I’m not usually one to enter contests because most prizes are things that don’t fit in my collecting goals and I don’t need more cards that I don’t need, but this contest is pretty simple and easy, so why not. I don’t have a lot of 2018 cards in my collection so far, but I was still able to find a few contenders. I’m going to start with three honorable mentions in no particular order and then the one and only winning card. You may be wondering what kind of things I consider. Well, first and foremost is the photo selection. I need the unique stuff. Someone swinging a bat won’t do it. Someone running the bases usually won’t do it. Pitching motions are a no-go. It makes sense that Stadium Club works as my example here. What I love about this picture is that it captures the celebration. So many cards will show the mid-air toss to first, but here we get a more complete story. The Cubs’ most dynamic fielder is in the field, on the grass with a fist pump and letting out a victory yell. Cubs fans are well aware of Javy’s passion, and here it is on display with the home ivy in the background. Another thing I like is texture. Not too many cards have that, but I’m more interested in cards that are printed on different kinds of stock or materials (like acetate) or are embossed or some combination of those. 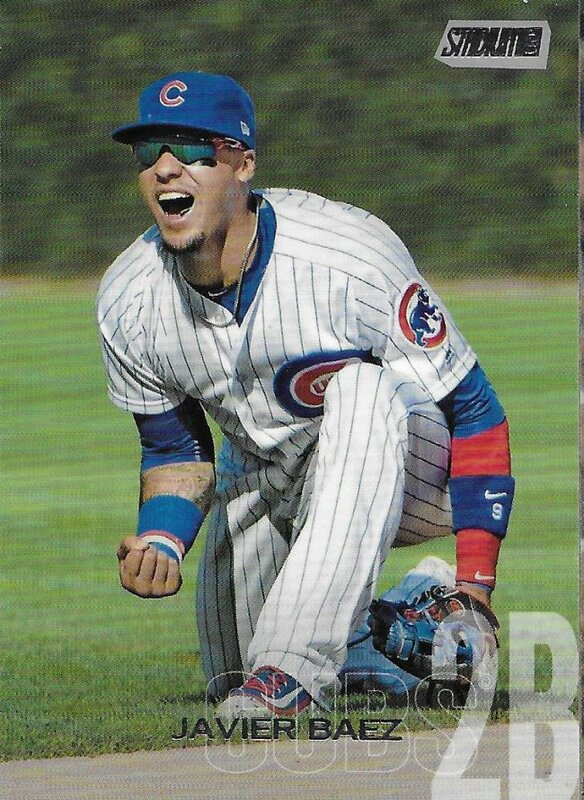 This near-winner was the first 2018 Topps card I got. I know some people hate manufactured relics, but I still like them due to the above. I’m a simple guy. It may not be from anything other than a printing press, but it passes the feel test. I also like that it pays tribute to the Players Weekend nicknames. 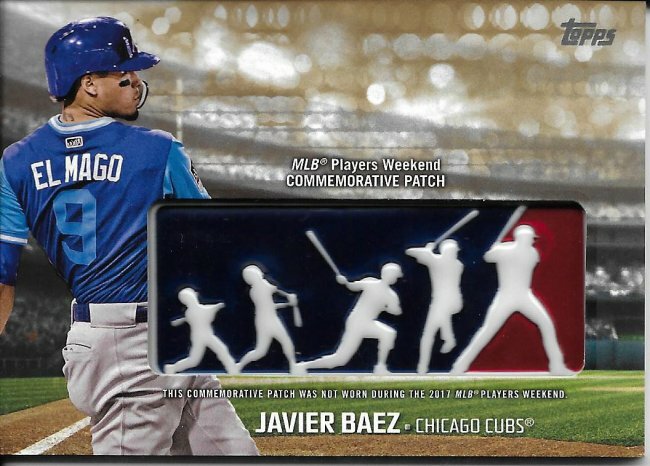 Baez has the best one on the team. Serial numbering can also be a factor, but it’s lower on the priority list. Relics and autographs can also be a factor. Bonus points for on-card ones. Relics are cool regardless of where they come from and they pass the feel test. 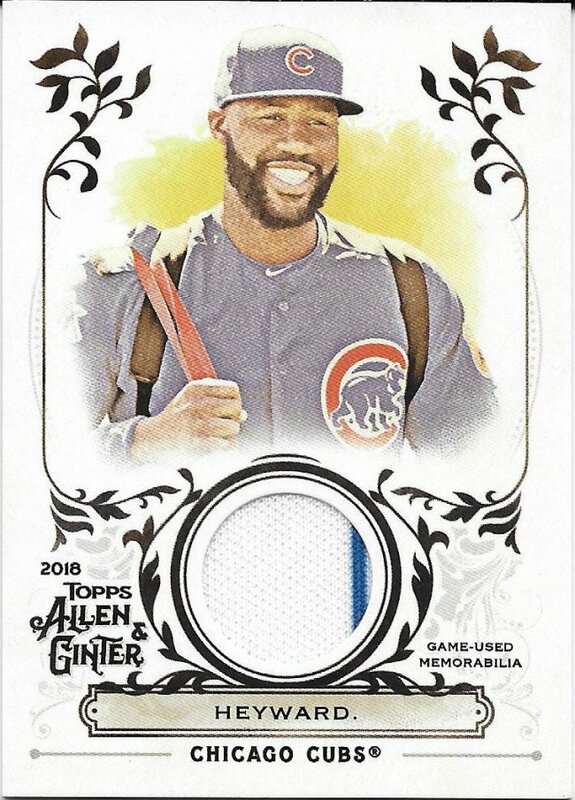 Heyward’s Ginter relic also passes the photo test. He looks like a happy kid with his backpack and bat slung over his shoulder and the yellow “sun” behind him. That’s a guy that’s super excited to play some baseball. Oh, and by the way, you can touch this piece of cloth! My #1 card of the year is this Topps Big League Thomas statue thing. There’s no fun tactile elements, but Big League was my favorite set of the year (so design is also a factor I haven’t mentioned yet). 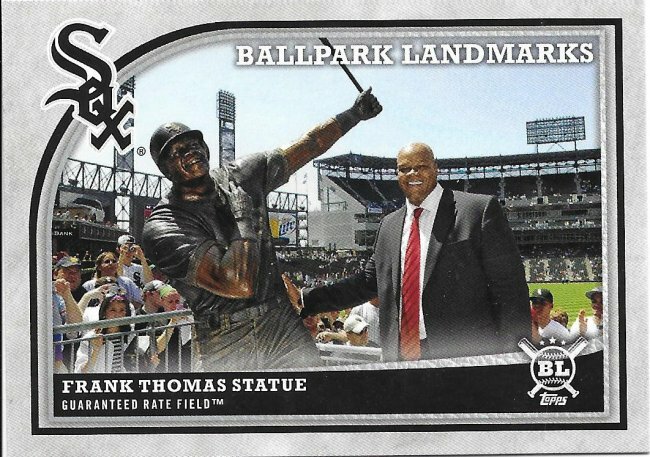 Stadium stuff isn’t featured on cards very often, and this is actually my first time seeing the Frank Thomas statue, I believe. You have the man and the myth side by side, both larger than life in front of the adoring crowd. It’s a great tribute to a great player in a great set. MVP #3 for the Big Hurt. Cool Thomas. I regret not adding some Big League into my card during the Black Friday sales. Yeah, Dave & Adams just sold out there stash of Bog League at $25 a box. That was a pretty good deal for a fun set. Nice selection of cards you have and that Thomas Big League is really nice. Good luck on Tom’s contest.